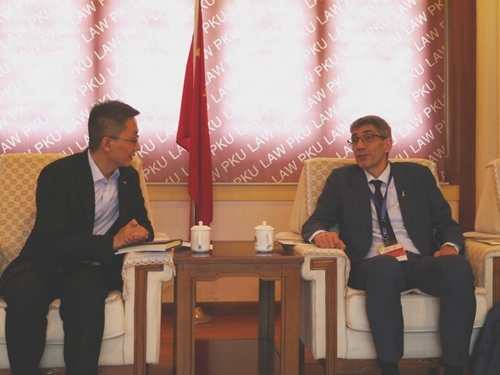 On May 5, 2018, Prof. Oron Shagrir, Vice President of The Hebrew University of Jerusalem, visited the Peking University Law School, signed a memorandum of cooperation between the two schools and a student exchange agreement, and had a friendly discussion with teachers and students of the PKULS. At 10 o'clock in the morning, under the witness of Tian Gang, Vice President of Peking University, the signing ceremony was held at Linhuxuan, Peking University. Prof. Zhang Shouwen, Dean of Peking University Law School attended the signing ceremony. Tian Gang expressed his warm welcome on behalf of Peking University to the visit of Prof. Oron Shagrir and his party. 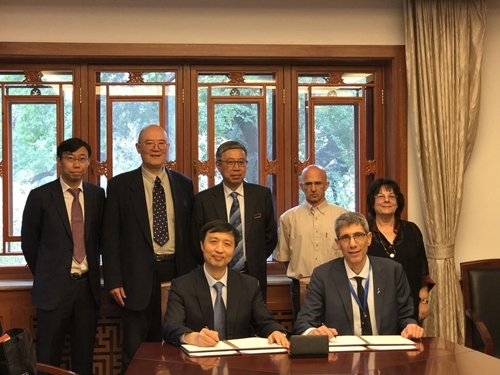 The establishment of the cooperation relationship between Peking University and Hebrew University is a celebration of the 120th anniversary of Peking University. He hopes that the cooperation between the two schools will continue to deepen in the future. 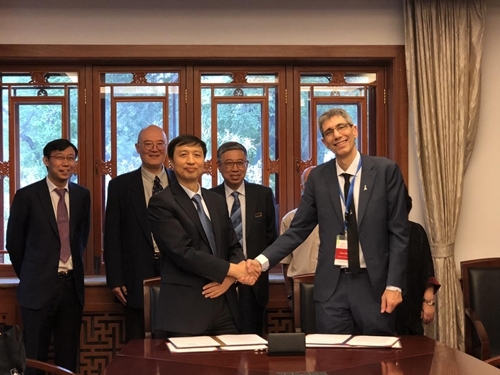 Afterwards, Dean Zhang Shouwen and Prof. Oron Shagrir signed a memorandum of cooperation between the two schools and a student exchange agreement. Both parties stated that the signing of the agreement is the starting point for cooperation between the two universities and they believe that the two sides can create a richer and deeper cooperation situation in the future. At 3 o'clock in the afternoon, Prof. Oran Shagrir and Prof. Lihi Yariv-Laor, Director of the Confucius Institute at Hebrew University, held a friendly talk with teachers and students of Peking University Law School. Prof. Guo Li and Prof. Wang Shizhou, teacher Yao Yueming and student representatives participated in the talks. Prof. Oron Shagrir said that the Hebrew University is very happy to start a series of cooperation with Peking University, one of the best universities in Asia. 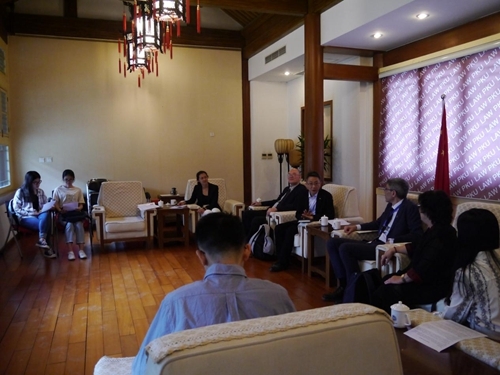 Vice Dean Guo Li thanked them for their trust in Peking University and hoped that both sides can taking this cooperation as an opportunity, expanding international cooperation in teacher exchanges and joint research in the future. Afterwards, the two sides introduced their main schooling situation. Prof. Wang Shizhou, briefly introduced the situation of the Confucius Institute at Hebrew University. Prof. Oron Shagrir also introduced the characteristics of Israel’s academic year division, English language teaching, and the protection of international student safety. The students participating in the seminar introduced the cultural differences between China and Israel to the Prof.Oran Shagrir. 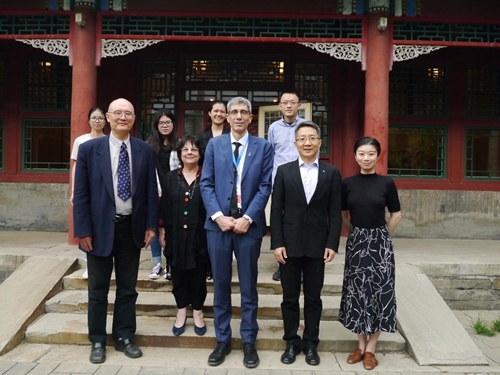 The visit of the Hebrew University is of great significance to promoting the development of the relationship between Peking University and Israel and the Middle East. It has laid a solid foundation for the two sides to reach fruitful cooperation in the future. The Hebrew University of Jerusalem was the first university of the Jewish nation and was also a symbol of the Jewish revival of the ancestral birthplace of the Jewish nation.It is the best school in Israel and is known as Harvard in the Middle East. Founded in 1918, it was officially opened in 1925 and is Israel’s premier university and leading research institution, enjoying an excellent reputation and leading position in the scientific community. The Hebrew University of Jerusalem emphasizes excellence and offers extensive learning opportunities in the fields of humanities, social sciences, precision science and medicine, and encourages multidisciplinary activities in Israel and overseas. According to the 2018 QS World University Rankings, The Hebrew University of Jerusalem is NO.145. So far, the university has produced eight Nobel Prize winners and one Fields Medal (Nobel Prize in mathematics) winner, and four other Israeli Prime Ministers graduated from The Hebrew University of Jerusalem. The Hebrew University of Jerusalem, Faculty of Law is the leading institution for Israeli law research and education. As the supreme institution of law in Israel, the law school gathers teachers and researchers who have a good international reputation and a high status in the Israeli legal field. Their research involves the global application of legal theory and more practical legal research from a comparative and critical perspective. These studies are regularly published in the world's top legal journals and publishing houses. The Hebrew University of Jerusalem, Faculty of Law ranks 101-150 in the 2018 QS World University Rankings in Law.